In addition to our wide assortment of monuments and gravestones, we offer a number of related services that you might find useful. These include monument cleaning, monument restoration, inlaid photos, on-site lettering, and sandblasting. You’ll find a description of each of these services below. If you’re in need of a service that you don’t see listed below, please feel free to call or write us. We may be able to help. 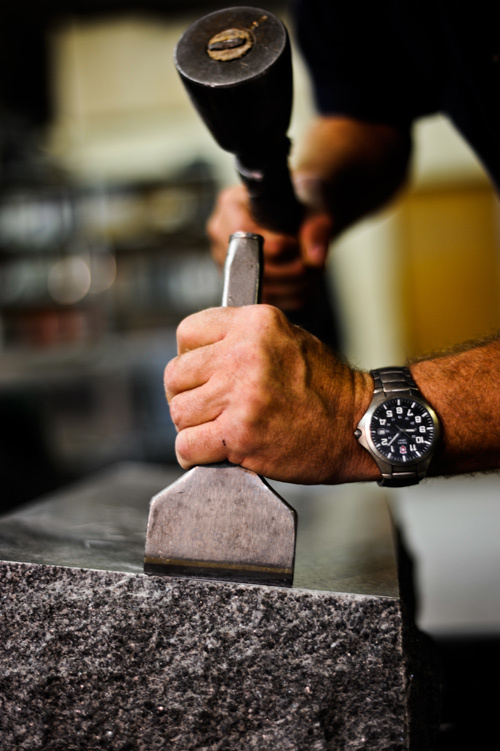 We have experience with restorations, damage repair, leveling and resetting monuments. An example of one project is the Cherry Creek Lutheran Cemetery. Although some cleaning can be done by yourself, many chemicals can damage granite if used improperly. We’re very skilled at cleaning monuments. Many chemicals and cleaners can stain and damage the surface of your monument. It is important the correct process is used in order to regain the beauty of the monument without causing further damages. We can clean and remove most hard water coatings and discolorations. Sandblasting works great when you need to strip away old paint or rust prior to painting or finishing a surface. At Family Craft Memorials, we have the ability to sandblast metal, wood, and aluminum parts. Give us a call today to discuss how we can help with your next project. We offer high-quality inlaid photos, in which an image is digitized then glazed and fired right onto a ceramic surface, making it impervious to the elements. We also have black granite plaques with laser etched images. They are available in black and white. You may need to add something to a memorial after it is set in the cemetery. Perhaps you need to add more design work, or you just need the death date added. In these cases, we have the ability to go to the cemetery and do the work on site without removing the stone.